Image credit & copyright: Don Goldman. 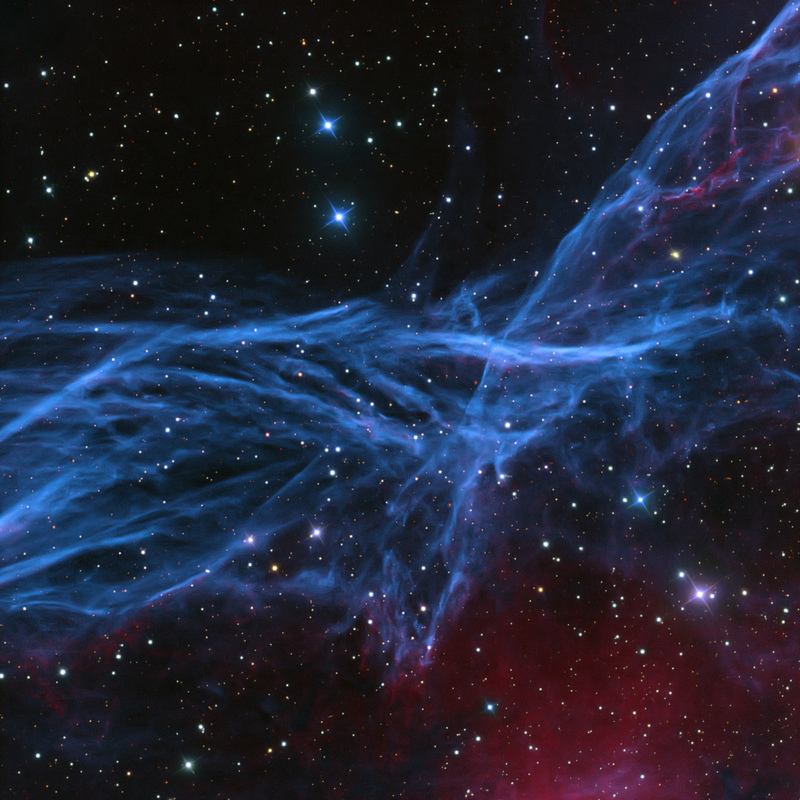 Roughly 800 light years away in the southern constellation Vela (Sails) is the Vela Supernova Remnant, of which this is a small portion of. Once part of a massive star, (a star with at least the mass of eight times that of our Sun) the material seen here was exploded out into the surrounding cosmos about 11,000 years ago when that star decided that it would try fusing silicon into iron. Interesting thought right? The iron in your blood and in your frying pan destroyed a star. When that star exploded, it’s possible that it created the very gold that you’re wearing on your neck and or hands. I like to explain this using the ash analogy. When a fire builds up too much ash, the fire dies because it can’t burn the ash. I know, stars don’t burn, they’re a nuclear reaction but the analogy holds. Once a star has begun to fuse silicon into iron, that star is as good as dead because it can’t fuse iron into anything. Iron is the star’s ash. You may now be asking yourself, “How we get the heavier elements such as gold if stars can’t even fuse iron?” Turns out that even though the star doesn’t have the energy to fuse iron, there’s enough energy in the instant of the supernova explosion to create the heavier elements we see in the universe. The exploded stellar remnant in this image will also serve the same purpose as its material will someday merge into a larger cloud of material and in time gravity will do what it does and collapse that cloud in onto itself. Eventually, pressures and temperatures will reach the point where fusion can spark another star to life. If planets form around it and if life forms on those planets, this material that we see right here in this image will have contributed to their arrival. What is it? : The remains of a star that exploded approximately 12,000 years ago near the dawn of written history. How far away is it? : 800 light years. How big is it? : Roughly 55 light years in diameter and 8 degrees of the night sky or 16 times the diameter of the full moon. This small section of the remnant is much smaller. Apparent magnitude: A very dim 12 or +12. Where is it? (General): Constellation Vela (The Sails) within the Gum Nebula. Where is it? (Exact RA/Dec J2000): RA 08h 35m 20.60s / DEC -45° 10‘ 35“. Image | This entry was posted in Astronomy (Learning), Astrophotography (DSOs), Images, Nebula (Emission, Reflection), Stars (Non-Sun Related), Supernovae & Novae, Thinkers and tagged Astronomy, Astrophotography, DanSpace77, Don Goldman, Science, Space, Star, Stars, Supernova, Vela, Vela Supernova Remnant. Bookmark the permalink.